2 To prepare the katsu, mix the mayo and water together in a dish. Place the breadcrumbs in a separate dish. 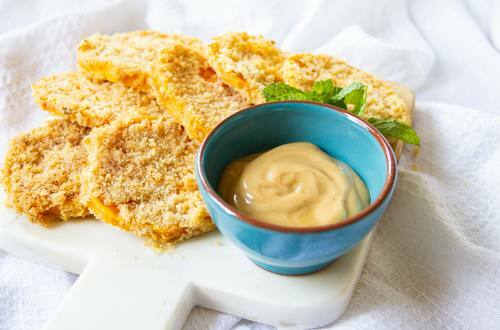 Dip the sweet potato slices into the mayo followed by the breadcrumbs, ensuring they are evenly coated. Place onto the baking trays. Bake for 20 minutes or until the sweet potato is soft and the breadcrumbs are golden. 3 Meanwhile, heat the soy sauce, mirin, brown sugar and ginger in a small saucepan over a medium high heat. Stir continuously for a few minutes until it begins to bubble and thickens. Set aside to cool. 4 Just before the sweet potato katsu is ready, mix 3 tablespoons of mayo with the teriyaki sauce. 5 Remove the katsu from the oven and carefully transfer onto a serving plate. Serve together with the teriyaki mayo dip!